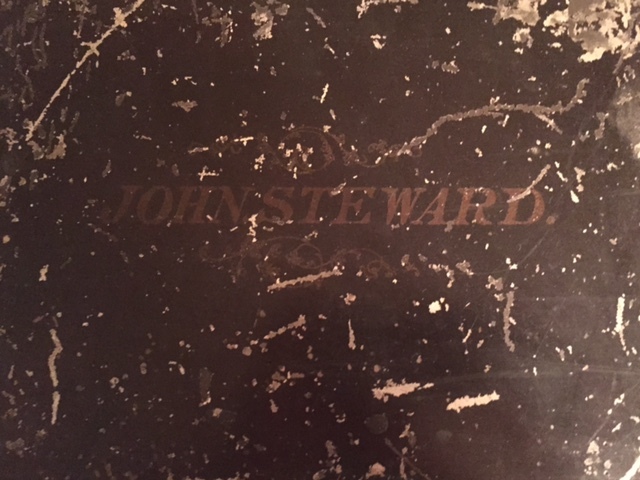 My grandfather died almost 25 years ago, and sometime before that he gave me a box of “family papers.” The box itself is rather striking: a metal strong box, easily portable, with my great-great-grandfather John Steward’s name stenciled on top in fading paint. Inside the box are not just family papers, but intriguing (and, of course, unidentified) daguerreotypes and examples of other early photographic processes, along with materials treating the family of my great-grandmother, Margaret Atherton (Beeckman) Steward (1861–1951). 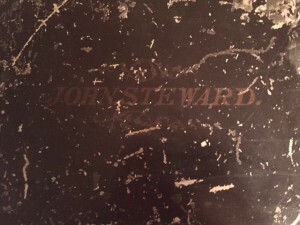 By and large, though, the papers in the box relate to the household and family of my great-great-grandparents, John Steward (1814–1901) and Catharine Elizabeth White (1818–1867). They reflect the winnowing process by which Catharine’s children and grandchildren became the sole representatives of Catharine’s parents, Campbell Patrick White (1787–1859) and Harriet Banyer Le Roy (1797–1885), as well as the expanded nuclear family over which Harriet White presided, including her son, daughters, son-in-law, grandchildren, grandson-in-law and granddaughter-in-law, and great-grandchildren. I thought it might be interesting to go through the box, taking out and examining some of the treasures it contains. Among them: the only image I have ever seen of my great-great-grandfather Gilbert Livingston Beeckman (1824–1874); early deeds associated with my great-great-great-grandfather John Steward (1777–1854), including the purchase of his first New York City house on Pearl Street; and the estate papers of my great-great-great-uncle and aunts, the unmarried siblings of Catharine White Steward. 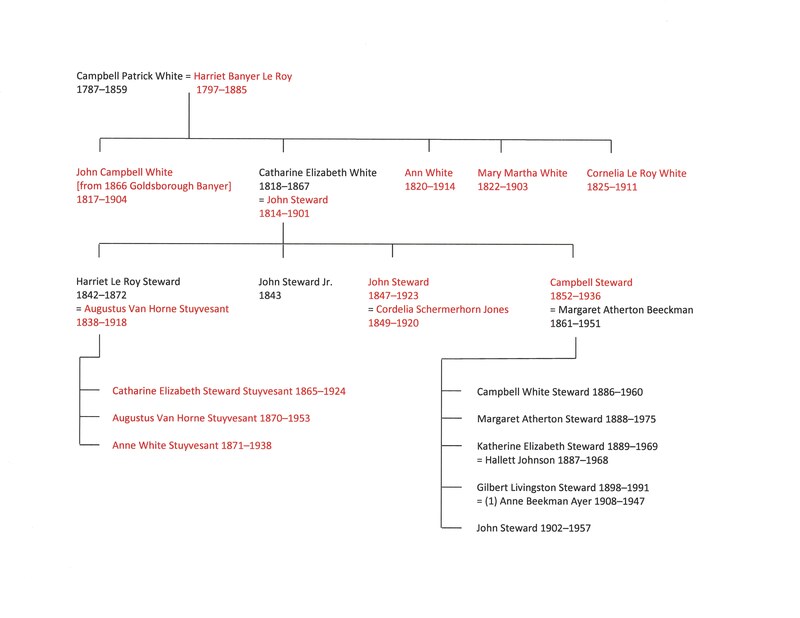 The family of Campbell and Harriet White. Click on the image to expand it. The chart above (with the members of Mrs. White’s household on West Twenty-first Street in Manhattan depicted in red type) has at least one curious feature: Mrs. White’s only surviving son, John Campbell White, changed his name as an adult to become Goldbsorough Banyer. Why? Thereby hangs a tale, one could say, as Mrs. White was the granddaughter of Goldsbrow Banyar (1724?–1815), Deputy Secretary of the Province of New York. In early middle age he married Elizabeth (Naden) Appy; of their children, one was Goldsborough Jr., who married the daughter of John Jay and died young, and another was Martha (Banyer) Le Roy. With the deaths of Goldsbrow’s sons and namesake grandson, he was filled with the understandable ambition to leave not just his substantial wealth but his name within the family, as various drafts of his will – updated to reflect the successive deaths – attest. Following her father’s death, Martha Le Roy’s son Goldsborough Banyer Le Roy (1802–1866) reversed the order of his middle and last names; he was known thereafter as G. Le Roy Banyer. Following Le Roy Banyer’s death, Uncle John White became Uncle Goldsborough Banyer. With the exception of my great-great-grandmother, none of Harriet White’s children married, and the Banyer name once again faced extinction. What to do? My grandfather told the story that his father, Campbell Steward (1852–1936), was approached on the subject of changing his name (or perhaps the names of one of his three sons) to Goldsborough Banyer. In due course, the Steward name would face extinction in our line – until my grandparents married and had three sons – as the Whites, Le Roys, and Banyers in our line had failed before them. Was my great-grandfather tempted enough by the prospect of Uncle Goldsborough’s wealth to follow in this not entirely prepossessing tradition? ETA: The series continues with a letter to my great-grandfather in 1871; an examination of my great-great-grandparents’ portraits; the eulogy given at my great-great-grandmother’s funeral in 1867; snippets from an early 19th-century Beekman family cookbook; another letter to my great-grandfather (from 1864); a review of some modern handwritten genealogical notes; my great-grandfather’s 1862 essay on a rather unsatisfactory Eastern potentate; a detour into early nineteenth-century deeds; an account of my great-grandparents’ 1885 wedding (including the minute log of wedding presents, one of them from Mrs. John Jacob Astor); situating my great-grandfather in the larger Steward, White, and Le Roy families; tackling some mystery family photos; looking at some collateral family members; analyzing the provenance of a letter from General U. S. Grant to an American admiral; and, perhaps, solving a long-standing identification question. You have the best “stuff” and the most interesting family!! Love reading your posts!! I love “treasure boxes.” What fun! Pardon my ignorance, but what is the definition of “ICYMI”? A Google search will lead to this, among other definitions: https://en.oxforddictionaries.com/definition/icymi. I have Stewards/Stewarts on my paternal family side and Athertons on my maternal family side. Could we per chance discuss our potential family links? Julie, I’d be glad to. I’m descended from John Stewart/Steward of Goshen, New York, and from Colonel Abel Willard Atherton of Castine, Maine.